Ten year NHL veteran and Islanders’ fan favorite Shawn Bates can only watch his teammates prepare for the upcoming NHL season. Rather than practice, the former Terrier speedster is rehabbing a groin injury that first occurred last season. He underwent sports hernia surgery followed by months of rehab, but the problem lingers. A Newsday blog article reports that “no comeback will be attempted until he is 100 percent healthy.” Bates is one of three ex-BU players on the Islanders, The others are “Battling” Rick DiPietro and All-American defenseman Freddy Meyer. A similar injury, finally diagnosed as a sports hernia cost former BU forward Dave VanderGulik half of his senior season in 2005-06. Returning to the lineup on Dec. 20, 2006 against Merrimack, he played all the remaining 25 games, registering 11 goals and 11 assists as BU won the Hockey East title and reached the second round of the NCAAs. Brad Zancanaro has been at the Hershey Bears (AHL) training camp albeit having signed a contract extension with Florida of the ECHL during the summer.The Caps offered this anecdote about Zanc and one of his former teammates-- "Chris Bourque, who is still in training camp with the Caps, wore uniform number 17 in Hershey the last two years and at 5'7" towers two inches over the 5'5" Zancanaro, who wore number 17 last night..."
Everblades are based in Estero Florida, which hosts the annual Florida College Classic holiday tournament for Division 1 teams. Joe DiPenta, who became the sixth Terrier to raise the Stanley Cup when the Ducks won last Spring’s playoffs, helped the NHL launch its 2007-09 season this past weekend “across the pond” in London. The Ducks split a pair with the Los Angeles Kings and DiPenta got on the board with his first assist of the year. Since his days at Winchester High School, defenseman Dan Spang has been labeled a two-way defenseman, combining crunching hits with ability to step up into plays and fire a heavy shot. Now in his second season with the Sharks' AHL affiliate in Worcester, the former All-American is adding more versatility. He's become a spokesperson for the organization, serving as the face of the Shark's "Be A Leader" program. Spang has been speaking before community groups and has even filmed some TV commercials for the program. On the ice, he's been solid but due to a few injuries and San Jose's depth on the blueline, Spang is still waiting for a call-up. Chris Drury and Scott Gomez, crown jewels of the Rangers July 1 raid on free agency, are now the featured players in the team’s pre-season promotional efforts. Drury, BU’s all-time goal scoring leader and the 1998 Hobey Baker Award Winner, and Gomez, a one-time Colorado College recruit who opted instead to play Major Junior, have been making the publicity rounds in New York with a write-up in ESPN Magazine (with accompanying video clip) and appearances on the Boomer Esiason Show on the MSG Network. Drury, who helped the Avalanche win the Stanley Cup in 2001, also is lending a hand to promote the Red Hot Hockey match-up between BU and Cornell at Madison Square Garden on Nov. 24. He’ll join Terrier Coach Jack Parker for a media conference call next Tuesday (Oct. 2). Big Red Coach Mike Schaefer also will participate with his own Stanley Cup winner, Joe Nieuwendyk. Werek's teammate, 2008 recruit Corey Trivino, a 6-1 center, recorded his sixth assist—and seventh point—of the season in last night’s game. After filling up the nets for the Spirit in preseason, the 2006-07 OPJHL Northern Division rookie of the year, has just one goal in eight games. Further West, 2008 goalie recruit Kieran Millan has a 3-3-1 record for the AJHL Spruce Grove Saints. Invited to the league all-star game as a rookie last season, Millan’s GAA is 3.54 after the Saint played several high-scoring games. Some additional Hockey East notes were posted on Mike McMahon's Warrior Rink Rat Blog. *About 20 games will use a two-referee, two-linesman officiating system. The games will be split as evenly as possible between all 10 schools. The NCAA could make it a permanent rule next year. If you didn’t catch it on SportsCenter last night, there was a brawl (video clip) during the Rangers-Islanders exhibition game. Simon and Hollweg were the first act and former BU All-American Freddy Meyer did some ice dancing with a Blueshirt, but the main performance was the squareoff between former Terrier goalie Rick DiPietro and his Rangers counterpart, ex-Michigan Wolverine Al Montoya—once the latter was able to lose his blocker. DP got the better of the battle before his night ended early. CSTV's Rink Rat Elliot Olshansky, the hardest working college hockey journalist, combined both above topics--Media Day and the on-ice fisticuffs--in his blog post today. USHR reported the Vinny Saponari commitment, pointing out that "In April, Saponari upped his already-high stock when he posted a 4-3-7 line at the IIHF World Under-18 Championship at Tampere, Finland." Warner went on to say: "Saponari, a 2/15/90 birthdate, is an excellent skater who likes the high tempo game and has shown an ability to score at every level he’s played at. He has a real knack down low." That's a comment every Terrier fan has been waiting to hear. USHR also reported that "The Terriers are still looking for other pieces and are in the hunt for 5’9” Salmon Arm (BCHL) forward Derek Lee, a ’90. They’ll be facing competition from Wisconsin and Michigan." Lee, who is a slick playmaking center and may be either an 08 or 09 recruit, visited BU ten days ago. He's already been to Wisconsin and will visit Ann Arbor next. Five games into the NTDP U18s 2007-2008 season, 2008 recruit David Warsofsky is proving a clutch performer. After setting up the game-winner in the opening game win over Chicago, the left-shot defenseman from Marshfield, Mass., notched the overtime winner in the U18s 2-1 victory over S.Minnesota in the NAHL Showcase. In five games, Warsofsky has a pair of goals and a pair of assists. Early reports say that 2009 recruit Max Nicastro, a 6-2 right-shot defenseman playing for the USHL's Chicago Steel, is off to a strong start. We've just learned that highly regarded NTDP U18 forward Vinny Saponari has committed to BU for 2008. The 5-11 right-shot forward from Powder Springs, Ga., scored 12 goals and 13 assists in 39 games last season for the NTDP U17s and then was moved up to the U18s for 19 games, including the World U18 championships (photo: scoring against Russia) , and added 4 goals and 3 assists. Before entering the NTDP program, Saponari played for Culver Military Academy as a teammate of his brother Victor, who is in this year's freshman class. Saponari's U18 teammate, David Warsofsky, will join him next season in a class that also includes Stouffville Spirit center Corey Trivino, Nobles winger Andrew Glass, a Washington draft choice, and goalie Kieran Millan of Spruce Grove in the AJHL. "Prep School sensation from Georgia plays the game the right way by giving up his body to make highly creative offensive plays. Saponari is a very explosive skater who is as good of a passer as he is a goal scorer. If he chooses to come to the OHL he will be an impact player within a year or two. He needs to get stronger but it seems as though this kid is destined for pro hockey with his great wheels and ability to think the game." We'll have more information about Saponari in the next few days. Hockey East will hold its annual Media Day tomorrow at the TD Banknorth Garden in Boston with the coaches’ preseason poll to be announced. Recent experience shows that even the coaches don’t have the best handle on what is to come. Two years ago, BU was picked to finish fifth and went on to win the league title. Last year, while projected #1 BC won, UNH, ranked fourth, finished just a point behind the Eagles. College Hockey News has completed its 2007-08 previews of all Division One teams. Some were written prior to player departures during the summer. Inside College Hockey will publish its annual ranking of incoming recruit classes later this week. last December, Red Line Report rated the Terriers’ 2007 class second behind Wisconsin and that was prior to the addition of speedy winger Joe Pereira. Bryan Miller, who spent two years in the Devils organization, was in the Blues camp and has been assigned to Peoria of the AHL. He’ll be seeing plenty of former BU teammates Dave VanderGulik and Sean Sullivan who will begin the season at Quad City (Flames) and San Antonio (Phoenix) respectively. Those teams are in the AHL’s Western Division. Much- traveled Carl Corazzini (photo) has left the BlackHawks organization and was assigned to Grand Rapids by Detroit. Carl has suited up for 19 NHL games with Chicago and Boston. Matt Radoslovich’s stay in the Norfolk Admirals camp camp was a brief but valuable experience. He's headed to the left coast and the ECHL Fresno Falcons but not before receiving encouraging "exit reviews". 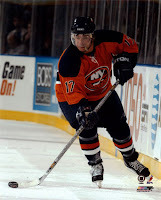 Norfolk’s coach is former Terrier captain and All-American center Steve Stirling, who was head man behind the New York Islanders bench from 2003 to 2006 and coached the Springfield Falcons last season. Ken Roche, who was in Avs camp on an amateur tryout, has been sent to the new Lake Erie Monsters where he'll skate for ex-Terrier and NHL forward Joe Sacco. Other Terriers sent to AHL affiliates: Dan Spang to Worcester (Sharks), John Curry to Wilkes Barre (Penguins), which always has a large contingent of ex-collegians, Mike Pandolfo to Lowell (Devils) and and Jakubs Redlihs to Syracuse (Blue Jackets). The U.S. National Under-18 team opened up their season on Saturday night by posting a 3-2 win over the Chicago Steel of the USHL in a game played in Ann Arbor. The matchup featured two future BU defensemen in David Warsofsky of the U-18s and Max Nicastro of the Steel. Warsofsky, in fact, played a starring role, dishing the puck to teammate Jordan Schroeder who notched the game-winning goal at the 14:50 mark of the third period. Nicastro didn't figure in any of the scoring for the Steel but did pick up a slashing penalty at the final buzzer. And speaking of picking up assists, future Terrier forward Corey Trivino picked up his fourth assist in three regualr-season games for the Stouffville Spirit on Sunday afternoon during their 4-3 loss to the Newmarket Hurricanes in OPJHL league action. Trivino, one of the prized members of BU's 2008 class, has collected four assists and one goal in three games for the Spirit. Goaltender Kieran Millan of the Spruce Grove Saints in the Alberta Junior Hockey League, who will be competing for playing time in the BU net in 2008-09, was on the losing end of a 6-4 setback against the St. Albert Steel on Saturday night. Millan's 16 saves proved not to be enough and in three starts for the Saints thus far he has posted a 2-1 record with a 3.35 GAA. Former BU walk-on Matt Radoslovich is on the training camp roster of the Norfolk Admirals of the AHL. The Admirals, whose training camp will run from September 17-23, serve as the top minor league affiliate of the Tampa Bay Lightning. Radoslovich followed up his career as a Terrier by spending the last two seasons playing for the Quad City Mallards of the UHL. But at the conclusion of the 2006-07 season, the Mallards folded as a franchise. The Admirals deemed Radoslovich worthy of a look after he compiled 35 goals and 43 assists while playing in 149 games for the Mallards. For fans looking to purchase single-game tickets for BU's 2007-08 home hockey schedule, word from the ticket office is to check the HAA web site for a availability on a daily basis, with seats expected to go on sale sometime during the week of September 24th. The Hockey News, in its September 18th issue, ran an article written by Ken Campbell on the on-going battle for teenage recruits between U.S. college teams and Major Junior Canadian Hockey League clubs. 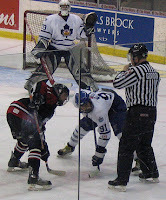 Both the OHL and the WHL have hired individuals as Directors of Educational Services to help awareness of the CHL's increased emphasis on continuing education for its players while the NCAA countered with a new recruiting measure that allows schools to contact players in the summer after their sophomore year of high school, allowing the CHL less of a free rein over swaying kids who are 14 or 15 years old. As Notre Dame coach Jeff Jackson said of the recruiting competition against fellow college teams and CHL squads, "I remember when I coached at Lake Superior State, we would recruit kids after their senior year of high school and we were dealing with kids who were 19 or 20. Now we're recruiting 14-year-olds." Patrick Kane and Angelo Esposito were two high-profile recruits that BU keyed on in recent seasons before both chose the Canadian Major Junior route, and you can bet that future Terrier recruits Corey Trivino and Ethan Werek will remain CHL targets until the day they lace 'em up for the first time at Agganis Arena. The US NTDP U18s open their 2007-2008 season tomorrow at the Ice Cube in Ann Arbor with 2008 recruit defenseman David Warsofsky joining Coach John Hynes's squad following two standout prep seasons. The opposition is the USHL Chicago Steel and Warsofsky will be going up against a future teammate, 2009 recruit Max Nicastro, also a defenseman. Nicastro (photo,right), who will spend the next two seasons under the tutelage of former NHL and Colgate defenseman Steve Poapst, is a product of the Los Angeles Junior Kings system. Last year he rang up 17 goals and 19 assists in 48 games for the Kings AAA Midgets. Warsofsky, with 15-34-49 in 29 games for Cushing Academy, was USHR’s 2007 Prep Defenseman of the Year. Another 2008 recruit, Corey Trivino, has already begun his season leading the Stouffville Spirit to a 4-3 opening night win over Collingswood with three assists. Trivino’s offense had been a key to Stouffville perfect 9-0 preseason including a tournament win. Last year, as a 16 year old, Trivino, a 6-1, 170 left-shot center, was the Spirit’s second leading scorer with 24-34-58 in 49 games earning OPJHL Northern Division Rookie of the Year. John Curry's professional career is off to a strong start. During Penguins rookie camp, he made two starts in the just-completed Kitchener Rookie Tournament, earning a round robin game win against Florida and then backstopping Pittsburgh to a 5-1 victory over Ottawa in the championship game in which he turned away 20 of 21 shots. Next up for the 2007 All-American goalie is the Penguins' main training camp beginning Thursday. Moving over to future Penguins, the Faceoff Factor blog posted a Q&A interview with BU sophomore blueliner Brian Strait, covering his goals for himself and the Terriers this season, his NHL role model and his weight room exploits at Pens development camp. Besides his visit to Pittsbrugh, Strait's summer included U.S. Junior National Team evaluation camp and attending the NTDP program 10 year anniversary event with fellow sophomore Luke Popko. The enhanced and CSTV-hosted new BU athletics Web site is up and running with improved graphics, new features and more video and podcasts. A video review of last season includes, among others, one of Tom Morrow's two career goals at BU. Fluto Shinzawa's recent Hockey Notes column in the Boston Globe looks at Chris Drury's move to the Rangers. Beat writers know that the former Hobey Baker Award winner and BU All-American, while one of the NHL's iconic clutch performers, is no Broadway Joe when microphones and notepads come out in the locker room. Drury dislikes talking about himself as much as he likes scoring playoff goals. Former Terrier netminder Jason Tapp has signed on with the CHL Corpus Christi Rayz for his sixth pro season.Tapp spent the past two years with the now-defunct UHL Quad City Mallards. Thanks to the blog reader who provided a link to video of 2008 recruit David Warsofsky scoring a goal last season for Cushing Academy. USHR's Prep Defenseman of the Year in 2006-07, Warsofsky will spend his senior year quarterbacking powerplays for Coach John Hynes' NTDP U18 team in Ann Arbor. Fellow 2008 recruit Corey Trivino continues his stong preseason play for OPJHL Stouffville helping the Spirit win the Vaughan Vipers tournament by scoring the overtime game-winner in the semi-final and adding a goal and an assist in the championshp game win. Salisbury Prep goalie Luke Montoni is the nephew of former BU standout Mike Hyndman, who still ranks tenth on the all-time Terriers points list. After two years as a high-scoring forward, Hyndman was moved to defense in his senior season and earned 1969-70 All-American honors. Hentoni put up good number this summer in USA Hockey's Select 15 tournament. ESPN's Terry Frei looks at the range of options now available to talented you American hockey players and mentions Kevin Shattenkirk, Ryan Whitney and Rick DiPietro, among graduates of the NTDP program. Much of the attention about and expectations for BU's incoming freshman class has been focused on d-men Kevin Shattenkirk and Colby Cohen due to their respective first and second round draft selections by the Colorado Avalanche in June. Expectations will be equally high for freshman left-shot center Colin Wilson, based on both his NTDP career and opinions from the scouting community. International Scouting Services has ranked him as the sixth best NHL prospect for the next draft. TSN Canada's pre-season survey of ten NHL scouts also ranks Wilson sixth in the 2008 draft class and second among forwards--despite being omitted on two ballots. Wilson, who reportedly has impressed his new teammates in the weight room as well as on ice, is still growing as the official BU roster lists him at 6-1, 215. He was born in Connecticiut while his father Cary, a former Dartmouth star and Canadian Olympian, played for the New York Rangers, but was raised in Winnipeg. There, a dominating performance in Canadian AAA midget competition (51-50-101 in 36 games) earned him a spot on the US NTDP U 17 team. USA Coach John Hynes brought him up from the U17s to play for the U18s in the 2006 World Championships, which Team USA won. Last season, he was the U18s second leading scorer (stat sheet doesn't include World U18s) with 30-44-74. At the 2007 World's, he was player of the game (video) in gold medal game loss to Russia and co-leading scorer in the tournament. Last week we reported on 2009 verbal Ethan Werek’s injury in a Stouffville Spirit exhibition game, just days before he was to “report” to the OHL Kingston Frontenacs camp. The same injury was described in the newspaper that covers the Spirit—without any mention of Kingston. Now, thanks to Canadian Hockey News, there is an update—sans any hometown agenda. which reveals, based on an interview with Ethan, that he’d planned to visit the Fronts camp to help make an NCAA-or-OHL decision. He’ll now wait until the injury heals—in 4 to 6 weeks— before deciding. Meanwhile, Werek’s would-be Stouffville teammate, BU 2008 recruit Corey Trivino (photo) was finding the back of the net four times in a 9-3 preseason game. 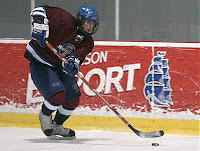 Trivino, last season’s OPJHL Northern Conference rookie-of-the year with 24-34-58 in 49 games, was one of just three non-OHL players on the 2007 Ontario U17 team. With less than six weeks left until the Terriers take the ice in the Nye Classic in Anchorage, it’s time to start looking at previews of upcoming opponents. Two weeks after the Alaska trip, BU will be in Ann Arbor for a pair against Red Berenson’s Wolverines. Jack Parker has let it be known that he’s expecting the incoming freshman to make the biggest impact of any first year group in several years. The same might apply to Michigan. Like BU, Michigan is replacing three starting defensemen and has recruited some highly-regarded blueliners. Kyle Woodlief of Red Line Report ranked the Wolverines’ 2007 recruit class for season third best, behind Wisconsin and BU. Two more future opponents, Cornell and Vermont, are profiled in the continuing College Hockey News preview series. Meanwhile CSTV Rink Rat Elliott Olshansky, the most traveled journalist in college hockey, offers thumbnail looks at the sixteen 2007 NCAA tournament teams with an eye towards whether they’ll improve or regress in the upcoming season. Among the five Hockey East teams, he projects that BU and UNH will step up while BC, Maine and UMass take a step back. On September 14,15,16, 2007, a good number of former Terrier players and coaches will gather in Toronto for a golf tournament. It is anticipated that both Jack Kelley and Jack Parker will attend. The purpose is to establish a branch of the BU Hockey Alumni in Canada and reconnect not only the former players with their teammates and players from all eras, but to also generate enthusiasm for the BU Hockey prgram in terms of support both financial and in visits to Agganis Arena. Prime organizers of the tournament, banquet and surrounding events are Darrell Abbott '69 and Joe Meehan '72. Mark Fennie '70 of Buffalo, NY is assisting as well. I began BU Hockey Alumni (as a small e-mail list) originally to stay in contact with players from the teams I managed between 1968-72. I provide e-mail updates to the list as the season goes on and BU has allowed me to use the official BU site reports of the away games to keep members abreast. One thing led to another, the list grew, and we now have players from the 50's to the present in the US, Canada, and Europe. The list is also used to inform former players of social events involving BU Hockey such as the annual Friends of Hockey Golf Tournament as well as news about teammates and coaches. 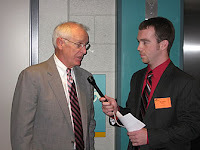 The list was used to reach many of the former players who returned to help celebrate the opening of the Agganis Arena. Each year former players return for their first visit to the facility and are just overwhelmed by the atmosphere and facilities. A far cry from the spartan Boston Arena and what was once the "state of the art" Walter Brown Arena, both of which hold fond memories for me and many others. Those who have had the honor of wearing the scarlet sweater are part of a continuum that began a century ago. Each a link from the past to the present. We have a storied tradition replete with National Championships, Eastern Titles, and numerous Beanpots. Our players have been Olympic medalists, Stanley Cup Champions, and WHA winners. They have been just as successful off the ice in a variety of professions. All are united by having worn the scarlet and white of the Terriers. Another interesting aspect is that most of our members have played for two coaches, Jack Kelley and Jack Parker, others were teammates of each of these men, and some played for both men. Solid support for BU Hockey can manifest itself in a variety of ways. The involvement of yesterday's players with today's program can pay numerous benefits and help return the program to the levels it enjoyed in the late 60's 70's and 90's when it was always a national contender. I'm grateful to Darell, Joe, and Mark for picking up this ball (or should I say puck) and running with it.